Reserve your spot at our COMMUNITY CRAWFISH BOIL, BEER& BAND event [music by jazz quartet Laissez Foure] on Sat, May 7 from 5-7PM at our Courthouse location in Arlington, VA [the next one is back at our Capitol Hill location on Sat, May 21]! Crawfish Boil Food Fest Tickets are $45 and get you hot, juicy, spiced up Louisiana Crawfish & Peel-n-Eat Shrimp with peppery New Potatoes & Corn-on-the-Cob, quarter Muff-a-lottas, Cornbread and Cajun Coleslaw. Wash it down with Abita — $15 Beer Tickets = four pours. [One food ticket minimum required for entry.] So grab a cold one and start peeling, sucking and eating a true Bayou delicacy! 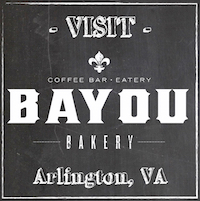 Call Bayou Bakery in Courthouse for tickets - 703.243.2410!